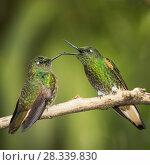 №28339830 Two Buff-tailed coronet (Boissonneaua flavescens) hummingbirds interacting, Andean montane forest, Ecuador. April. №25302546 Buff-tailed Coronet hummingbirds (Boissonneaua flavescens) interacting. Mindo cloud forest, Ecuador. №27793647 Black, buff, brown, and white chickens on a farm outside a chicken coop pecking and foraging for food. №25196481 Buff Wyandotte rooster perched on antique wooden egg case in grass beside rose bush. Calamus, Iowa, USA. №25306024 Buff-tailed Coronet hummingbird (Boissonneaua flavescens) perching on a feeder. Mindo cloudforest, west slope of the Andes, Ecuador. №25159831 Buff brahma bantam (gold and black) rooster in green vegetation, Higganum, Connecticut, USA.